Sterling supplies a range of instruments for the accurate measurement and inspection of soft contact lenses. All instruments use the best-practice method of immersing the soft contact lens in a saline solution, using a wet cell for lens analysis. The soft contact lens is positioned on a 10mm diameter cylinder. A probe is raised through the center of the cylinder via a micrometer screw and hand operated dial (BCOR scale). The lens diameter is viewed on a projection screen. The BCOR value is read from the BCOR scale. A graticule (i.e. grid lines in the focal plane) is mounted within the wet cell and is projected along with the plan view of the soft contact lens. This method ensures accurate measurement of the lens diameter, irrespective of magnification at the viewing screen. The smallest division is 0.1mm. The JCF is available with or without a saline filtration system. 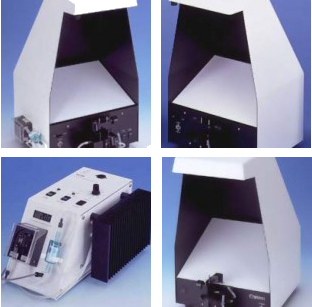 The JCF/F offers a peristaltic pump mounted on the cabinet, which feeds saline back to the cell via a renewable cartridge filter. The pump system removes particles from the saline, to ensure that the image of the contact lens in the wet cell is not affected by these. Both the JCF and JCF/F can be fitted with the TC20 temperature control system. The TC20 is a consistent and accurate solid state-cooling instrument, using the reliable Peltier effect. A temperature probe using an NTC thermistor is immersed in the wet cell, and the saline is heated or cooled to the required temperature. It is then maintained at that temperature at all times. The Chiltern is an economical and cost-effective version of the JCF, which operates on the same principles of measurements. It cannot be fitted with saline filtration or temperature control, and the design of the optics is simplified to reduce costs. Nevertheless, it is an accurate and useful instrument for checking soft contact lenses, and is used by both practitioners and manufacturers for a variety of inspection tasks.